Team17 has revealed that yet another free update will arrive in Ghost Town Games' Overcooked 2 with a tease very reminiscent of December's Kevin's Christmas Cracker update. Last month, the UK-based publisher shared the teeniest, tiniest of teases hinting at something festive; four days later the content arrived, boasting five new kitchens, three new recipes, and two new seasonal chefs all for free. We're expecting something similar here, too, adding to that Winter update, as well as the New Game+ Mode, Surf 'n' Turf DLC and complete base game which were available before that. Wow. Team17 mentions that anyone eager to follow this new update should keep an eye on its official Twitter account for clues, linked below. 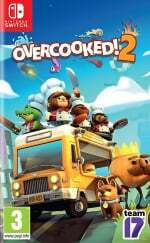 Are you a fan of Overcooked 2? Are you hungry for more content? Let us know in the comments. But the game itself is still AGH...!!! Update coming on/in time for Tuesday? Yeah very lunar new year/ spring festival feel!! I believe some new dishes include chinese buns, chicken stew and beef noodles!! Like i really needed another reason to stay on this game (240 hours). I'm excited for the free update, please be challenging haha. Winter one is fun and got us playing again. Betting this will do the same! A good strategy, too, I think as these are like little mini-releases to remind people that they should buy the game if they haven't.